A black and white stereograph taken from a glass plate negative of the interior view of the "Russell Record" newspaper shop in Russell, Kansas. 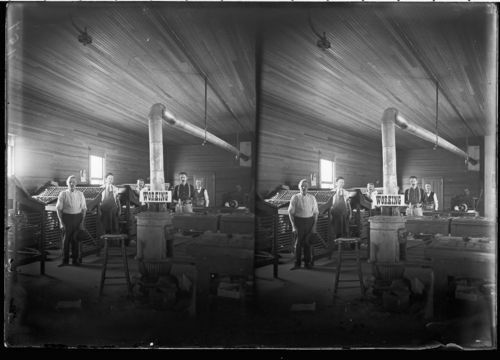 The interior view of the shop shows three men standing next to a row of type cases, while two men are standing behind a wood stove. A black and white sign with the word "working" is attached to the stove pipe.